Weight Capacity: 220 lbs Length: 10 ft. 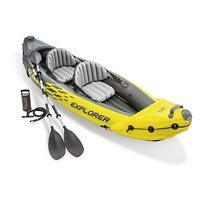 The Bestway 122-inch by 27-inch Hydro-Force Wave Edge Kayak is an excellent water sports accessory. This kayak has a unique design suitable for various paddlers, and it can handle plenty of weight along the frame. During time-sensitive boating situations, the Bestway can be inflated quickly with the included highly efficient pump, and environment hazards won't harm the housing on the water, as the plastic material is strong and tough. Very pleased. Fast shipment and a good deal. Transaction was great, package arrived quick! Pump seems weak link in this unit. Leaks before desired air pressure obtained. Fast shipping...delivered Saturday in one day. This board is really good value and build quite well. We also have Bestway Hydro-Force White model (which we purchased last year) and in comparison, this model is about 3in longer and slightly narrower. The material and glued seem quality is quite good. Overall board is great for the price if you compare it to some brand names (we own sea eagle wave board). After inflating the board we used hairdryer to heat some bent areas and help the material to even out and remove folding marks. Our kids can’t wait to take out the boards. This is a good high quality board, especially for the price. Everything you need is included. It would be a great board for a child. Unfortunately it is not a good choice for an adult, especially a larger adult or someone without SUP experience. I am an experienced paddler, and only weigh about 110 lbs, but still found this board to be a little less stable than I hoped. I don’t know how on earth someone 200 lbs could use it. For a newbie, or a normal sized adult, this is likely not the board for you. Great value! Good pump. Love it. This is a great size board. Wanted to save some money and not go the bigger 6" deep board. So for the price I could not pass it up. Big enough for yoga. Love that it is blows up easy and fast. The pump has attachments that work on other inflatables as well. Love it!! I don't know much about paddle boards, but I bought this for my 15 year old daughter. She has been having a blast using it on the lake near our house. She had been talking it out multiple times each day. It seems well made. It's light weight, but very stable. She is making plans to take it to the beach next weekend. I'm thrilled with it. I expected to pay a lot more for something of this quality. I can't tell you how many compliments I have gotten on this paddle board from folks who know something about paddle boards. For me, who didn't know much about paddle boards when I ordered it, I am having so much fun it's ridiculous. I am a short 59 year old woman and I get this thing inflated in 5 minutes flat using the manual "air bazooka" pump. I can't make a mistake with inflation because there's a pressure gauge included. 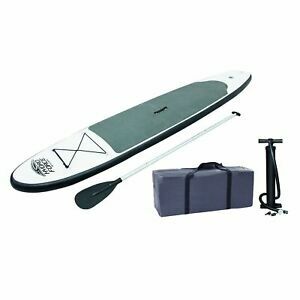 I can easily pick the board up by the built-in carry handle and get it to the dock and back to the car. It's very sturdy, and the padding on the top is so thick I can kneel and paddle comfortably even with my arthritic knees. It deflates easily, rolls right up and stores in the nifty carry case for my next adventure, along with the paddle and pump. It's a super deal, I would buy it again tomorrow. It's saving me money, because renting a board at the local lake is $40 an hour. When I go out, I stay at least 2 hours. It's already paid for itself. Highly recommended.